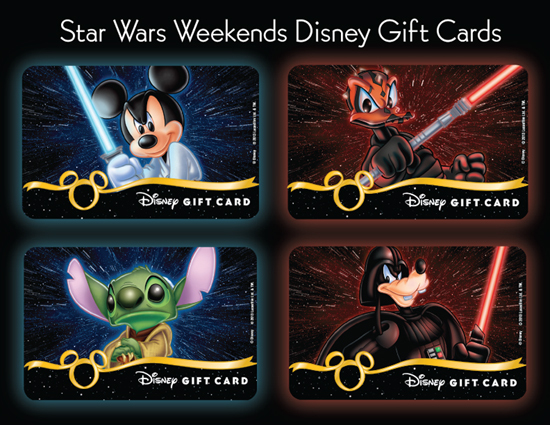 Unique Star Wars Weekends Gift Cards will be available at Disney’s Hollywood Studios during the length of.Star Wars Weekends. Each week will feature a mash-up of Disney's iconic characters in Star Wars costumes! Get them while you can! Check out the release dates of each card below. Be sure to check back with JEDIMOUSEKETEER.COM for all the latest updates on Star Wars Weekends 2013! Book your Star Wars Weekends Disney trip TODAY with Kristen Hoetzel of Magical Journeys Travel! Kristen and I were featured Star Wars cosplayers in Disney Park's SWW 2010 week 3 video!